Puss Reboots is holding a contest and the prices are books. 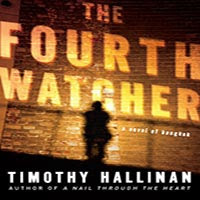 The Fourth Watcher: A Novel of Bangkok by Timothy Hallinan. To qualify your comment must include a suspense or thriller recommendation. It can be a book, film, graphic novel, manga… just something thrilling or suspenseful. Winner will be notified via email at 11PM on August 13th and will have 3 days to respond with a mailing address. If no response is received in that time, a new winner will be picked. Open to the entire world. So what are you waiting for, visit the site and join! Interesting.. I think I’ll join too! Thank you for you comment, you flatter me! And I’m honored to be on your blogroll. Your blog is very captivating… I’m definitely going to be a frequent visitor. Hi disturbed stranger, Thanks for the visit. You’re welcome anytime. You do write well, and I always express what I truly feel.